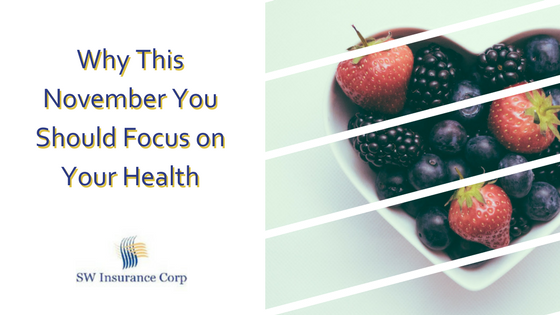 Why This November You Should Focus on Your Health | SW Insurance Corp.
Every month is a good month to take care of yourself! It is important to know and understand that as we age there are different tests that need to be conducted. For women, October has become not only an important month to support those who are fighting breast cancer, but also to memorialize those who have lost their battles. It also serves as a reminder for women to get their annual mammogram to help with early cancer detection. In 1983, President Regan designated November as National Alzheimer’s Disease Awareness Month. Today, the purple ribbon campaign helps to raise awareness of the disease that affects more than 5 million Americans. In addition, the month also serves to celebrate and support those caregivers who are so important to patients suffering from Alzheimer’s. Although there is no definitive test for this disease, November is a time to talk to your loved ones about it and also to discuss with your doctor what you should look out for when it comes to early detection. There are currently over 25 million Americans who suffer from a form of diabetes. That figures out to be over 8% of the total population. If you have a family history of diabetes, there are some things you can do this month to reduce your risk. Begin eating healthier, particularly cutting out processed sugars and carbohydrates. If you smoke, you should also quit as this can lower your overall health and improve your chances of developing diabetes. Finally, choose this American Diabetes Month as a chance to get more active every day, so that you can stave off obesity and diabetes. Approximately 15 million Americans have been diagnosed with this disease and another 12 million have it and don’t know it. COPD affects the lungs, making the simple act of breathing an act of agony. In acknowledgement of this month, be sure to talk to your doctor about this disease and find out what steps you can take to improve your lung health and ensure that you do not become one of these statistics. This health month designation is to raise awareness of the importance of skin care and skin health. Particularly, this is the best time to make an appointment with a dermatologist to have any unusual moles or skin patches checked out to ensure that you don’t have skin cancer. In addition, this month draws attention to the most common skin issues such as acne, eczema, and dermatitis. These are just four ways that you can spend time educating yourself about the various diseases that can affect your health. This November, do something for yourself and your loved ones and spend some time sharing what you learn about keeping yourself healthy.